Russian oil giant Rosneft announced that it has delivered the first commercial crude oil from the Erginsky cluster in Western Siberia to Transneft pipeline system. Erginsky cluster, which is located in Khanty-Mansi Autonomous District-Yugra, is made up of Erginskoe, Zapadno Erginskoe, Kondinskoe, Novo—Endyrskoe and Chaprovskoe fields. The total reserves of the cluster, which was created based on the integration of the infrastructure of Erginsky license area and Kondinskoe group of fields, are 259mmt of light, low sulfur oil. Rosneft had won the rights to develop Erginsky area for RUB20.7bn (340m) through an auction in July. While the cluster is spread over 5,000km2, the company said that the exploration would continue across all license areas for developing the resource base. The first Erginsky startup complex features the main oil and gas production and oil transport facilities. It also has a central processing facility (CPF) designed to have a capacity of 2.3mmt of oil per year and more than 120mmcm of gas at the first stage. Other features of the first startup complex are a 42MW gas turbine power plant and high voltage power lines, and a 68km pipeline for transporting oil to the Transneft oil pipeline system. Rosneft says that it had commissioned 133 wells with total length of up to 4,500m. The company plans to drill 2,420 production wells as well. The oil giant expects the maximum production of Erginsky cluster to reach 8.8mmt per annum and about 5,000 new jobs to be created for the project. The company revealed that the Khanty-Mansi Autonomous District –Yugra is a key area for its operations and is home to some of its major assets. 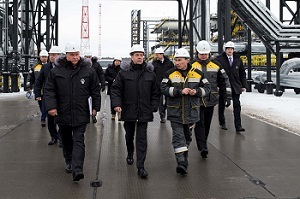 Rosneft claims to have hydrocarbon production of 137mmt per annum in the region. Image: Commissioning event of the Erginsky cluster in Western Siberia. Photo: courtesy of ROSNEFT.